I'd like to welcome author Pamela Schoenewaldt to Book Club Exchange. Ms. Schoenewaldt is the author of two terrific historical fiction novels WHEN WE WERE STRANGERS and SWIMMING IN THE MOON. I recently reviewed SWIMMING IN THE MOON and I enjoyed it a great deal; however, that wasn't exactly surprising since I also really liked WHEN WE WERE STRANGERS. Both novels are immigration stories as well as coming-of-age tales -- two of my favorite types of books -- so it's no wonder that I'm a big fan of her work. When Ms. Schoenewaldt offered a guest post, I jumped at the chance and immediately requested a special essay for my Book Club Exchange feature. I think you'll like what she came up with! Since publishing When We Were Strangers (2011) and Swimming in the Moon (2013), I’ve been to, Skyped to, emailed and speaker phoned to dozens of groups in homes, churches, schools, restaurants, retirement communities, back yards and book stores. All are different; most are mostly women; and in every one there’s warmth, welcome and intricate connections of books and life. Since both of my books are about the immigrant experience, I’ve heard amazing stories of love and loss, adventure and discovery. I’ve also heard many people say their family members didn’t or couldn’t share their own stories and through my characters these readers have experienced the journeys of their ancestors. In reading many other titles, we’ve all discovered parts of our own or our families’ journeys. Naturally, structure, or lack of it, varies. Organized clubs set their reading lists a year in advance. Mine spends ridiculous amounts of time picking the next book after each meeting; we’re never more than a month ahead. Some groups assign a presenter for each title and move methodically through a list of questions. A group of English teachers which read When We Were Strangers seemed to know the plot and themes better than I did and drew connections I hadn’t been consciously aware of. My group features disorganized discussion. A Rumanian mathematician friend wouldn’t last a meeting with us. In his group, each member assigns a grade 1 to 100, with decimals allowed, as in 93.5. Grades are defended and vigorously debated. Next, each person sums the book in four (4) words; then a hypothetical film version is thoroughly cast. Finally, each person has the opportunity to re-grade the book, although (naturally) my friend never, never changes his grade. I’m tired and a little stressed just describing Vlad’s process. Often there’s food, usually fabulous. Some book clubs make meals inspired by the book they’ve just read. At least one I know has an artist who creates a centerpiece from the book. Last week, a book club hostess made a delicious bean soup dinner based on the "beans and bread" diet of the strikers in Swimming in the Moon. 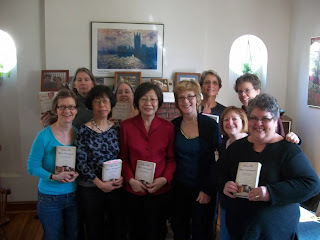 My friend Ellen’s group (pictured, me being the one without a book) began when their children were toddlers; some members have grandchildren now. Through it all, they’ve been faithful friends in every chapter of life. In my city of Knoxville, TN, the “Third Friday” group has met (guess when) monthly since 1911. In Ohio, the 26-20 club started in 1894, with twenty members, meeting 26 times a year. The group stays at 20, exactly, with some fourth and fifth generation members. In all this variety, book reading becomes the best it can be: personal discovery and social connection. Good fiction (usually) and good friends. Plot and life reflect and enhance each other. Books, wine, food, and friendship come together. There’s a respite from the busyness of life, intellectual stimulus and emotional journeying, friendly debate eased by wine and food; boundaries are stretched and new authors discovered. I’ve read and enjoyed titles I would never have discovered otherwise. For writer and reader, book groups are a marvel. What’s yours like? How does it operate and how does it enrich your life? Let me know. And if you have a book group that would like to read Swimming in the Moon, let me know how I can help. Pamela Schoenewaldt lived for ten years in a small town outside Naples, Italy. Her short stories have appeared in literary magazines in England, France, Italy and the United States. Her play, “Espresso con mia madre” (Espresso with my Mother) was performed at Teatro Cilea in Naples. 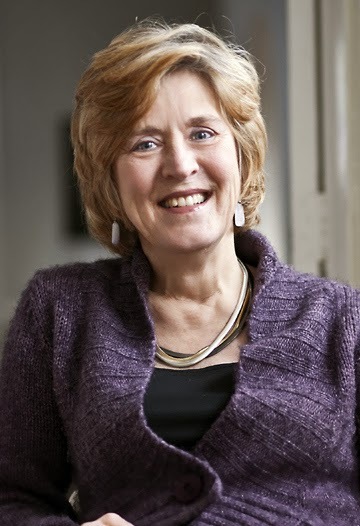 She taught writing for the University of Maryland, European Division and the University of Tennessee and now lives in Knoxville, Tennessee with her husband, Maurizio Conti, a physicist, and their dog Jesse, a philosopher. A huge thanks to Ms. Schoenewaldt for participating in Book Club Exchange! Some of those book clubs sound intense! Mine is pretty laid back - we usually just wing it.